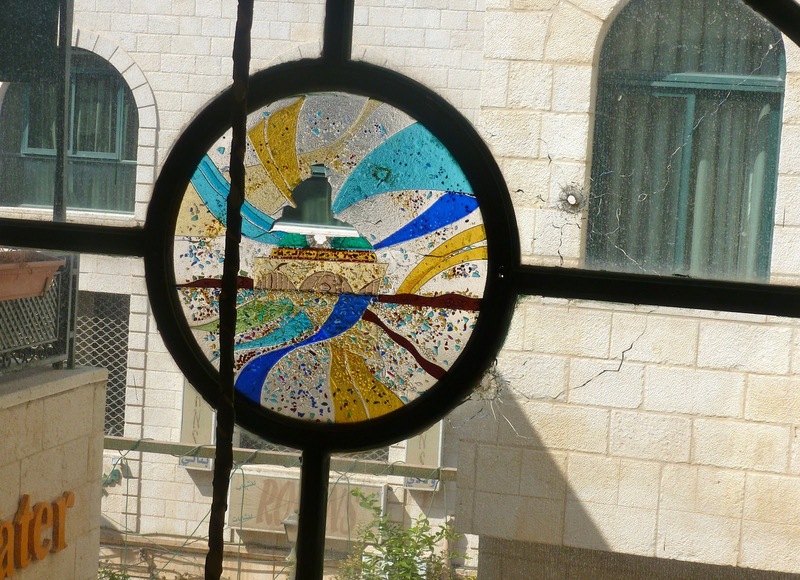 Following his recent trip to Nablus, as part of a delegation from the Dundee-Nablus Twinning Association, Alister Rutherford has written a report for his blog, which we have reproduced below. I am not long back from a visit to Nablus as part of a delegation from the Dundee-Nablus Twinning Association. We all had a wonderful time and some of the party are still there – the lucky ones. This post will focus on my initial thoughts on what this visit has told me about the overall political situation in Palestine. At first sight everything in Nablus looks fine and dandy. The place is very lively, lots of busy shops, full of all kinds of goods. The streets are full of cars and there do not appear to be any travel restrictions. 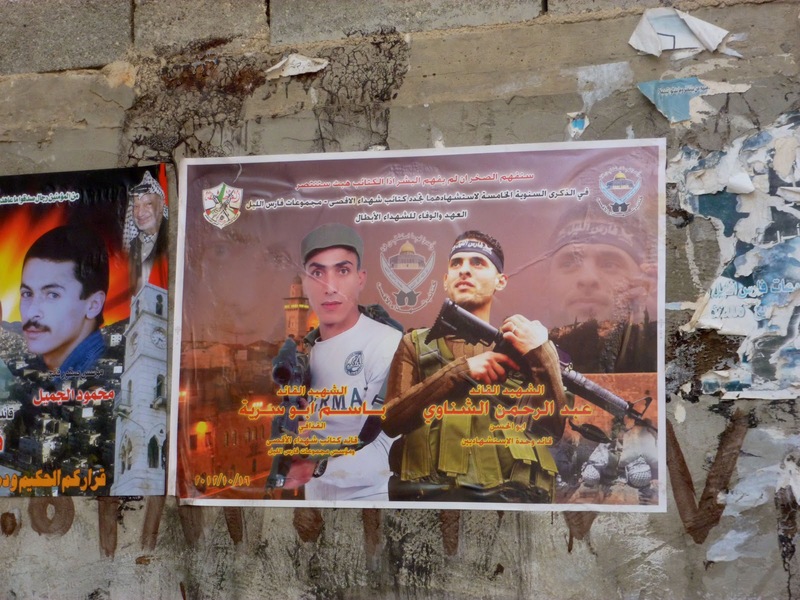 So it came as a bit of a surprise to find the town covered in posters with photos of armed resistance fighters – dead fighters, all killed by the Israelis. Still these posters did seem a bit out of kilter with the rest of the town. That is until you look a bit more closely and ask a few questions. You then remember that Nablus was occupied by the Israeli army from 2002 during the second intifada. Though the soldiers are no longer in the town, evidence of their stay is everywhere. Even our hotel had windows with bullet holes, like this one. Even more disruptive was the destruction of whole houses. In the old town we met a Canadian woman who now lives in Nablus and she pointed out a newly rebuilt building just along from her house. This was a building that the Israelis had destroyed, claiming that a resistance fighter was inside. He may have been, but in the process the Israelis killed nine people, including a pregnant mother and her baby. So it is perfectly understandable that the Israeli occupation is never very far from the minds of Nabulsis. It is not the case that the occupation has ended. It has just changed. 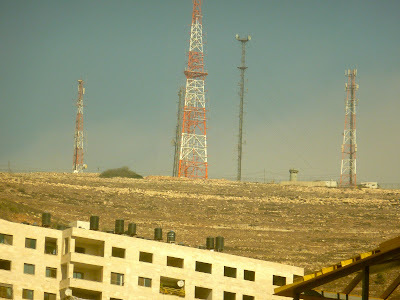 The Israeli presence is everywhere and the effects of their presence is a constant factor in living in Nablus. During the week we were there, we witnessed Israeli military aircraft flying overhead, an unmanned drone crash landed just outside the town and soldiers invaded Balata refugee camp to arrest two young men. The Israelis keep a permanent watch over Nablus. This includes a military outpost on one of the hills above the town. 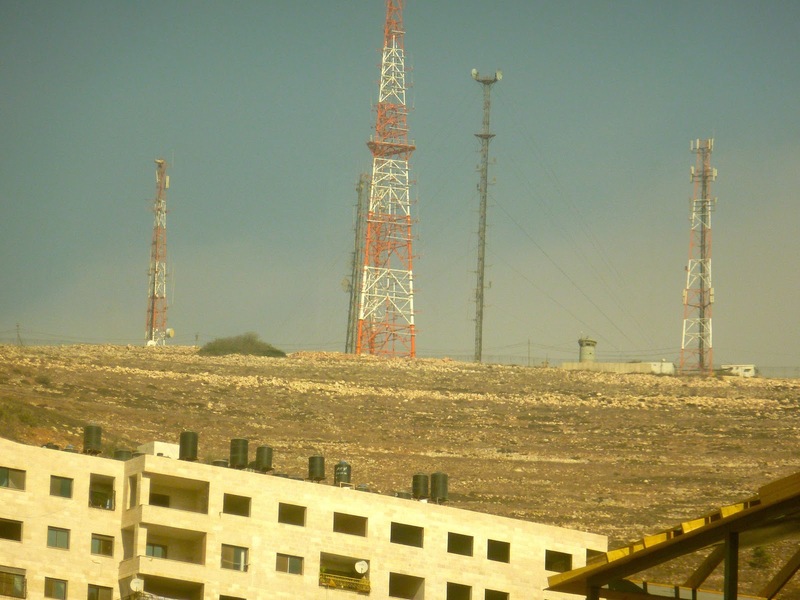 The small watchtower where Israeli soldiers look down on the town can be clearly seen to the left of the red and white tower on the right of this photo. While travel in Palestine is less restrictive than a few years ago, the checkpoints are still there, as are the guard posts. Cars still have to slow down due to the traffic slowing devices built into the road. At any moment the Israelis can close a road and staff the checkpoints with soldiers. There is even a military camp just outside Nablus. Travel in and out of Palestine is of course completely controlled by the Israelis and it can be a terrifying experience to get in or out of Palestine through Israeli controls as we can personally testify. Goodness knows what it must be like for Palestinians. The Palestinian economy is, like travel, completely dependent on Israel. The two economies are bound by the some currency – the Israeli shekel, over which Palestine has no say whatsoever. We had the good fortune to visit the new Northern are Electricity Distribution company and see at first hand the modernisation programme they are carrying out. But, they are totally dependent on Israel for the supply of electricity. And of course there are these twin sides of the coin – the refugee camps and the illegal settlements. While Jews from anywhere in the world can come and with Israeli government support illegally build houses on land stolen from Palestinians the Palestinians from Jaffa and other areas now in Israel, are forbidden to return to their villages and have to make do with living in a desolate, confined space in the camps. Many of the settlers around Nablus are not averse to using violence to harass and even destroy the olive trees of the Palestinian farmers lower down the hillsides. 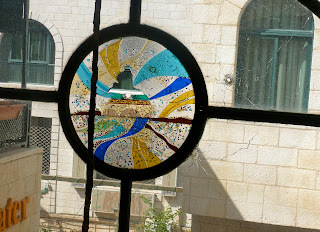 So, while Nablus is a vibrant and lively town, you only need to spend a few days there to experience at first hand the debilitating and humiliating effects of the occupation. For make no mistake about it, however much things have improved for some Palestinians, Palestine remains under occupation. Two of the key demands of the Global Boycott, Divestment and Sanctions movement are brought to life by just a short stay in Nablus – End the Occupation and the Right of Return for Refugees. 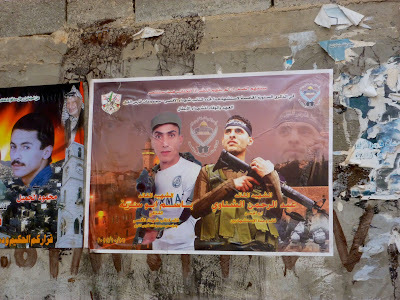 This entry was posted in Nablus, Occupation, Uncategorized and tagged Nablus, Occupation, West Bank. Bookmark the permalink.